Definition at line 28 of file ServiceRep.h. Definition at line 34 of file ServiceRep.h. Definition at line 154 of file ServiceRep.cc. Definition at line 160 of file ServiceRep.cc. Referenced by Adaptation::Icap::ServiceRep::callWhenReady(), and Adaptation::Service::wants(). References Adaptation::Service::detach(), Adaptation::Service::detached(), Adaptation::Service::finalize(), and Adaptation::Service::theConfig. Referenced by Adaptation::Icap::ServiceRep::announceStatusChange(), Adaptation::Icap::ServiceRep::availableConnections(), Adaptation::Icap::ServiceRep::checkOptions(), Adaptation::Icap::ServiceRep::detach(), Adaptation::Icap::Xaction::dnsLookupDone(), finalize(), Adaptation::Icap::ServiceRep::finalize(), Adaptation::Icap::Xaction::finalizeLogInfo(), Adaptation::Icap::ModXact::finalizeLogInfo(), handleFinalizeFailure(), Adaptation::Icap::OptXact::makeRequest(), Adaptation::Icap::ModXact::makeRequestHeaders(), Adaptation::Icap::Xaction::openConnection(), Adaptation::Service::Service(), Adaptation::Icap::ServiceRep::setMaxConnections(), Adaptation::Icap::ModXact::start(), tryConfigureAndStart(), Adaptation::Ecap::XactionRep::updateHistory(), Adaptation::Ecap::XactionRep::updateSources(), Adaptation::Icap::ModXact::validate200Ok(), and Adaptation::Service::wants(). Definition at line 294 of file ServiceRep.cc. Definition at line 299 of file ServiceRep.cc. Definition at line 170 of file ServiceRep.cc. References Adaptation::Service::cfg(), Adaptation::ServiceConfig::connectionEncryption, DBG_IMPORTANT, debugs, YesNoNone::defaultTo(), Adaptation::Service::finalize(), Adaptation::Ecap::FindAdapterService(), handleFinalizeFailure(), Must, theService, tryConfigureAndStart(), up(), and Adaptation::Service::writeableCfg(). Definition at line 213 of file ServiceRep.cc. References Adaptation::ServiceConfig::bypass, Adaptation::Service::cfg(), DBG_CRITICAL, DBG_IMPORTANT, debugs, and theService. Definition at line 251 of file ServiceRep.cc. References AsyncServices, debugs, Must, NULL, EventLoop::registerEngine(), EventLoop::Running, theService, and up(). Definition at line 164 of file ServiceRep.cc. Definition at line 232 of file ServiceRep.cc. Definition at line 272 of file ServiceRep.cc. References MemBuf::append(), buf, MemBuf::content(), detached(), MemBuf::reset(), MemBuf::terminate(), and up(). Definition at line 195 of file ServiceRep.cc. References AsyncServices, Adaptation::Service::cfg(), DBG_IMPORTANT, debugs, HERE(), and theService. Definition at line 237 of file ServiceRep.cc. Referenced by finalize(), makeXactLauncher(), status(), and wantsUrl(). 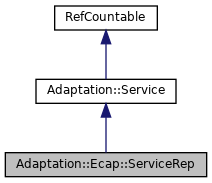 References Adaptation::Service::broken(), Adaptation::Service::cfg(), Adaptation::ServiceFilter::method, method, AnyP::Uri::path(), Adaptation::ServiceFilter::point, Adaptation::ServiceFilter::request, Adaptation::Service::up(), HttpRequest::url, and Adaptation::Service::wantsUrl(). Definition at line 242 of file ServiceRep.cc. References SBuf::c_str(), Must, theService, and up(). Referenced by finalize(), and Adaptation::Icap::ServiceRep::finalize(). Definition at line 53 of file ServiceRep.h. Referenced by detach(), and detached(). Definition at line 52 of file ServiceRep.h. Referenced by finalize(), handleFinalizeFailure(), makeXactLauncher(), tryConfigureAndStart(), up(), and wantsUrl().